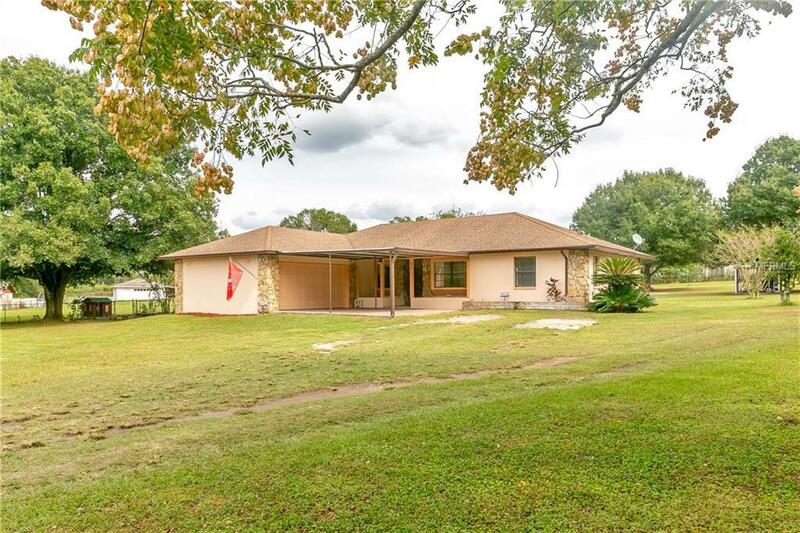 Updated, move-in ready home with detached game room on 1 acre!This 4 bedroom, 2 bath, 1,423 sq.ft. home features updated kitchen and baths, new tile flooring throughout, new paint inside and out, new ceiling fans, new a/c, and an 800 square foot detached game room. Enjoy a bright and open floor plan! The living room has triple pocket sliders that open to the back patio. Just off the living room is the dining area and kitchen, which boasts granite countertops, all new cabinets and two closet pantries. Just past the kitchen is a 6x6 laundry room with upper cabinets. On the opposite end of the house are three guest bedrooms and an updated guest bathroom. The master suite is split from the other bedrooms and features a walk-in closet, ensuite bathroom, and sliders to the back patio. Out back, theres an 800 sq.ft. detached game room featuring tile flooring throughout, wet bar with stainless steel refrigerator, new roof (2017), and two additional storage garages. Other features of this home include a fully fenced yard, security system, fruit trees, new septic drain field, new outlet covers and switch plates, a two car carport, and no hoa or cdd.